Ecco’s Genua shoes for men help you look professional in all situations. At least this is what they’re promising. In my opinion, they’re elegant enough to wear with business outfits, and even for special occasions like a fancy New Year’s Eve party. Ecco Genua is highly comfortable and has an air circulation system that absorbs moisture. 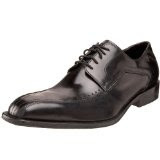 Business men that have to wear daily at least 12 hours the same pair of shoes will love this model for its comfortable side and elegant appearance.